Vancouver can be such a fickle place sometimes. For such a major metropolis, there are surprisingly limited options for late night desserts. Do people not like sweets here? I'm pretty sure that is not the case. Of course there are many places in town that do have baked goods and desserts, but they are not open at night. 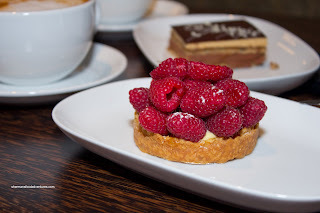 That leaves us with such places as Sweet Revenge, True Confections, Death by Chocolate and an assortment of other places where we can satisfy our dessert cravings at night (other than actual restaurants). Without counting gelato or ice cream joints, we don't have a tonne of options. 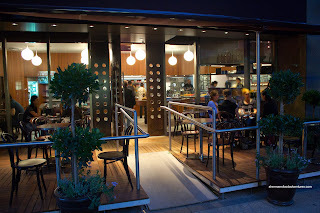 With the recent opening of Thierry Patisserie on Alberni, there is now a new option (until midnight!). 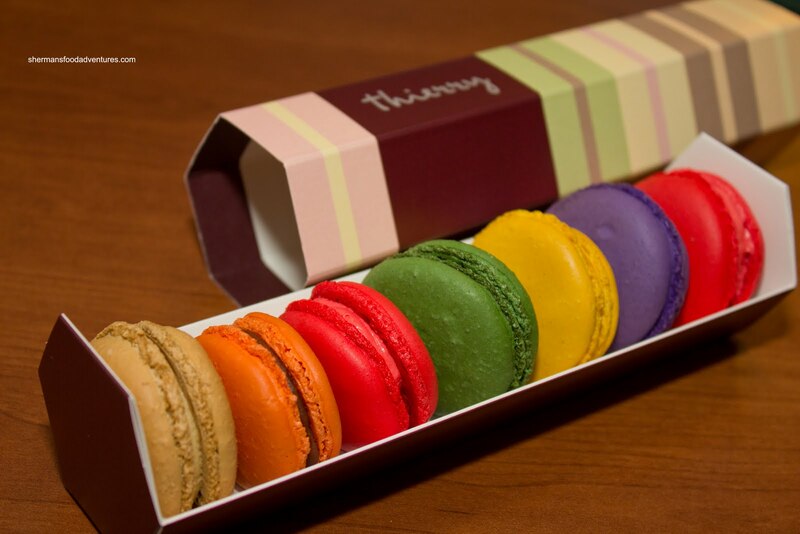 Following a similar model as Thomas Haas, Thierry offers up baked goods, desserts, chocolates, sandwiches, macarons and beverages. 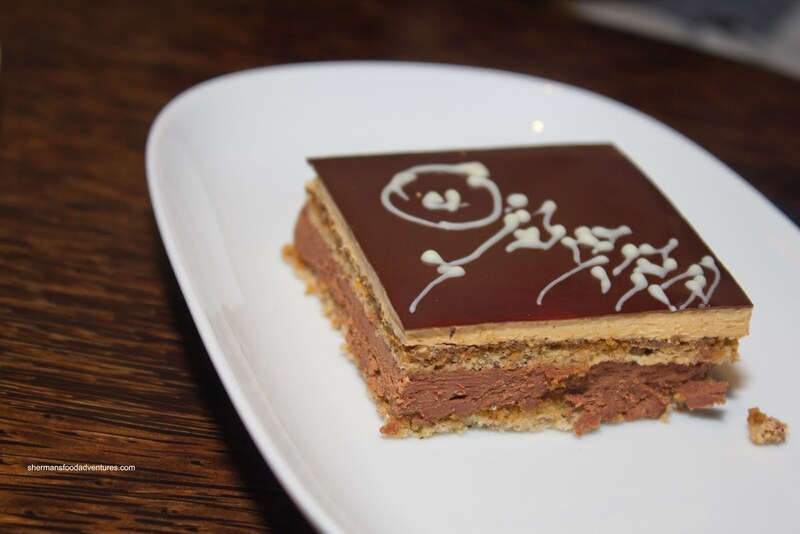 As the namesake implies, Thierry is headed up by award-winning pastry chef Thierry Busset formerly of Cin Cin. I must admit, the place itself is très chic and the macaron display makes one want to try them all (which I did by the way). 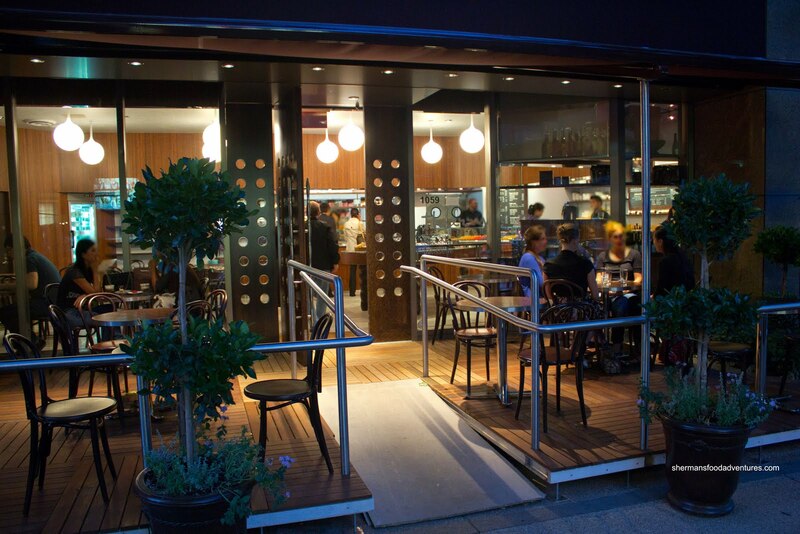 Naturally, with a central Downtown location and the name, the prices are on the higher side. With that being said, it is less than one would pay at a fine dining establishment. In fact, the prices are not far off the aforementioned dessert places. 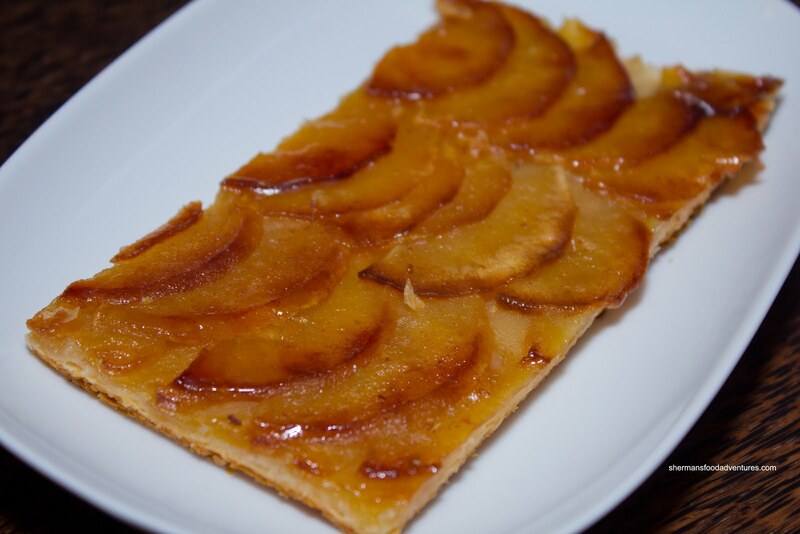 Originally, I had my heart set on the Apple Tart, but they sold out. So I settled on the Raspberry Tart. This was a pretty good tart. The pastry was crispy, firm and had a buttery-nutty flavour. I really liked the tart shell. Hidden inside was a semi-sweet custard that had a perfectly silky consistency. The raspberries were fresh, sweet and tart. Mr. X had the Opera Cake which had "O-P-E-R-A" in terestingly scribbled on top. The first thing I noticed was coffee syrup which gave a liquor-type flavour to the cake. The chocolate ganache as well as the buttercream was smooth and only slightly sweet. This was surprisingly light considering the components. Within the same week, I returned to Thierry with Viv, Costanza and Elaine. I finally got to sample the famous Apple Tart. Apparently, this is THE thing here. The first time I had it, I liked it. I've had it again and I'm not convinced with all the hype. Don't get me wrong, it's not bad, yet I'm not sure if it is better than anything Thomas Haas produces. Costanza wanted something chocolatey and went for the Chocolate Trio. Obviously, by its namesake, there are 3 different types of chocolate mousse layers in the cake. 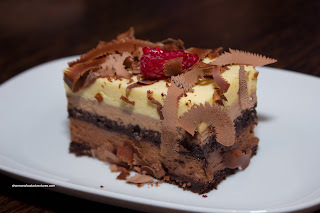 Sandwiched between layers of moist chocolate cake, there was dark chocolate mousse with another layer of milk chocolate mousse on top. Lastly, a white chocolate mousse was the icing on the cake so to speak. Despite the plethora of chocolate, this was not an overly sweet cake. In fact, it could be considered "light" if you can believe it. Really not hard to eat at all, it was that smooth and airy. Not sure if he was aiming to eat 2 desserts or not, but he also got the Pistachio Eclair. I thought he was sharing with Elaine, however, I swore she barely ate any. Hidden inside the perfectly executed choux pastry was actually the standard vanilla custard filling (which was beyond standard in quality). 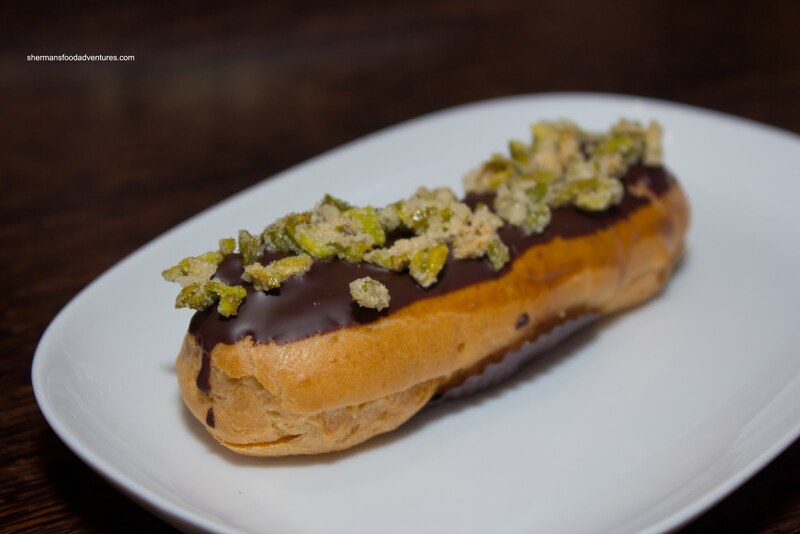 The pistachio part of the eclair sat on top of the chocolate as candied pistachios. That added a nutty crunch which was a nice textural contrast of sorts. This was good. For my son, he's not really into the dessert thing. 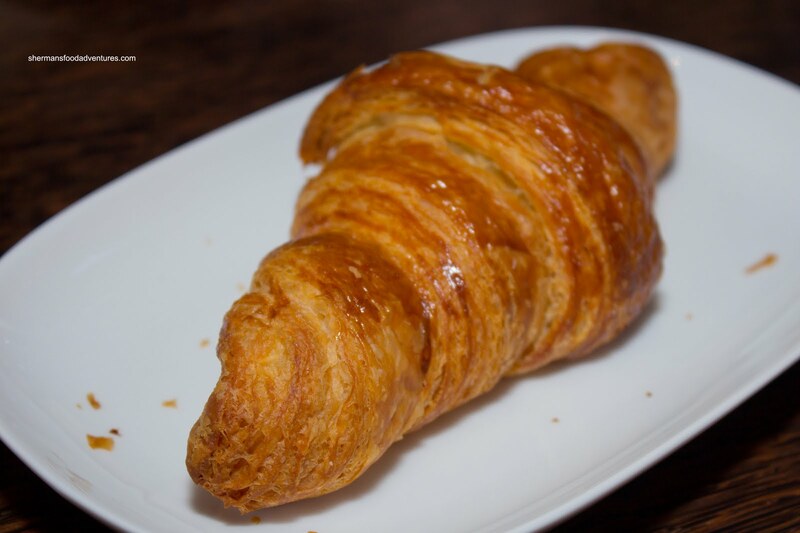 So he opted for a plain ol' Croissant. Well, like everything we have tried here, it was solid. The crisp, aesthetically pleasing exterior yielded a butter inside. I wouldn't say it was overly buttery, it was just right. However, I like the one from Faubourg more. As for the Macarons, I got a pack of 7. From left to right was coffee, passionfruit, raspberry, lime, lemon, blackberry and raspberry again. These were noticeably bigger than most macarons which made them a decent value for $1.75 each (or $11.95 for a box of 7). 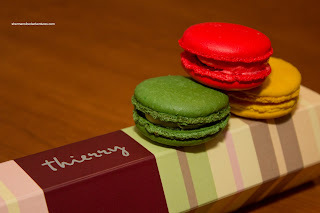 Now, for a disclaimer of sorts - my first ever experience with macarons was with Pierre Herme. That is akin to buying a Ferrari as your first car. With that being said, these macarons were not bad. However, I would go for Thomas Haas over these. The exterior was crisp and they were chewy throughout. I would've preferred less chewiness. The buttercream fillings in the all of them except for the passionfruit (which appeared to be a combination of chocolate ganache and passionfruit) were a tad weak. However, a nice little surprise lay within in the form of jam or piece of fruit. The one thing that had me thinking after the fact was the a particular aftertaste in a few of them. Was it the food coloring? I would like to believe it wasn't, but I swear it was. Maybe someone can enlighten me if I am wrong. All-in-all, the desserts we tried were not bad. I liked the decor and vibe of the place. It definitely has style and an air of class (I guess that is what I can call it?). With that, there comes a cost and a high one at that. I did mention that Thierry is generally less expensive than fine dining restaurants. Yet, that doesn't mean it is cheap either. I guess it really depends on one's preference and their threshold as to how much they are willing to pay for premium desserts and chocolates. When I heard about Theierry opening I was super excited, a new dessert place! I do plan on checking it out. I tried the macarons and I didn't notice the aftertaste, I did notice they were bigger than normal. I didn't think they were terrible tho., but I agree they do not come close to Pierre Herme. We've been spoiled! I had high expectation for Thierry before it opened. The pastries selection (esp the cakes) were too American-style to me. I was hoping for it to be another Parisian-style Patisserie in Vancouver ( we don't have many selections in Van aside from Ganache Patisserie in Yaletown ). You were spot on with the macaron as they really need more works on it, the shell's size were not consistent and the ones I had were over-baked. I've tried Pierre Herme's macaron myself and you were right that they were no where near PH's macaron yet. @WG Nope, the Macarons are far from terrible. They just could be better! @LPV Yup, the macarons can use some improvement but the pastries are very good though!